It’s been 22 years since “Jurassic Park” came out, and “Jurassic World” brings us a vision of what things might be like 22 years after the catastrophe at the dinosaur zoo. If you just want to sit in a cool, dark theater and admire CGI dinosaurs, you will not be disappointed. If you want a film with character development, actual characters, or any semblance of good writing, stay far, far away. Mr. Masrani (Irrfan Khan) has turned the island into a theme park with more dinosaurs and what superficially looks like better security. His director of operations, Claire (Bryce Dallas Howard), is very good at running things from the control room, but not so good with people. Her nephews Gray (Ty Simpkins) and Zach (Nick Robinson) come to visit, on the same day as some investors who want to see the latest, greatest attraction: Indominus rex, a bigger, badder version of Tyrannosaurus rex. Naturally, Indominus manages to escape, leaving a trail of chaos and demolished security features in her wake. 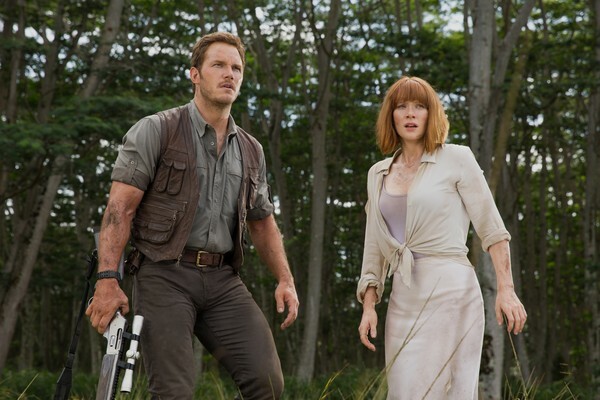 Gray and Zach get lost in the park, and Claire asks Owen (Chris Pratt), an ex-Navy guy doing experiments in training velociraptors, to help her find them. So far so good, right? Except Claire is every career woman stereotype rolled into one, and somehow we’re supposed to not only agree with her sister that of course she’ll have kids some day, we’re also supposed to believe she can outrun dinosaurs in 3-inch heels. Even after pointing out how impractical her shoes are, the film does absolutely nothing with them. She doesn’t use them as a weapon, take them off and steal a dead person’s shoes, or anything. When Owen tells her they’re useless, she rolls up her sleeves and opens her overshirt to reveal more cleavage as a way to convince him she can handle everything. Since this happens just as things are really getting dire in the park, it’s more than a little odd. The film keeps up its pace pretty well, and although most of the dialog is annoying, unnecessary, or both, the dinosaur fights are good. The dinos are pretty much all CGI rather than practical effects, and they clearly ate up the entire budget, because almost none of the other effects are any good (watch for the CGI helicopter with no shadow, which lands like a 4-inch toy). One of the few things the film gets really right is the relationship between Owen and the four velociraptors he’s been training. They’re highly intelligent wild animals, and while they’re pretty willing to follow Owen’s directions in exchange for freeze-dried rat treats, they still know he’d be tasty if they had the chance to eat him. Pratt has a ton of natural chemistry, and he does a great job of not only being convincing as a raptor trainer but believable dealing with the humans around him who have no idea how dangerous the raptors really are. It’s a bit of a drag after the capable Dr. Ellie Sattler of “Jurassic Park” to have a movie whose only female characters are either fodder for dinosaurs (one minor female character’s death involves multiple dinosaurs and a lot of screaming as she’s tossed around between them), sexist stereotypes, or both. If you don’t mind that (and all the other annoyances and failings of the film), it’s a fun ride. Is it worth full price at a fancy theater? Probably not.